Santa Claus, also known as ‘Saint Nicholas’ or simply "Santa", is a fantasy figure with legendary, mythical, historical and folkloric origins who, in many western cultures, & is said to bring gifts to the homes of the good children on the night before Christmas, December 24. However in some European countries children receive their presents on St. Nicholas' Day, December 6. The modern figure of Santa Claus was derived from the Dutch figure of Sinterklaas, which, in turn, was part of its basis in hagiographical tales concerning the historical figure of Christian bishop and gift giver Saint Nicholas. I have taken the idea from here to make this recipe and change the recipe according to my needs. In a small bowl take warm water, add the yeast, dissolve and make slurry. Keep it aside. In a sauce pan add butter, milk, sugar and bring it to boil. Switch off the gas. In a large bowl, combine flour and salt. Then add the yeast slurry and mix well. Add butter milk sugar mixture and mix well with hand resembling bread crumbs. If this mixture is too dry add some milk, knead well and combine to form dough. Turn onto a floured surface; knead until smooth and elastic, about 5-6 minutes. Place in a greased bowl, turning once to grease top. Cover and let rise in a warm place until doubled, about 1 hour. Divide the smaller portion in half. This also one portion little larger than the other. 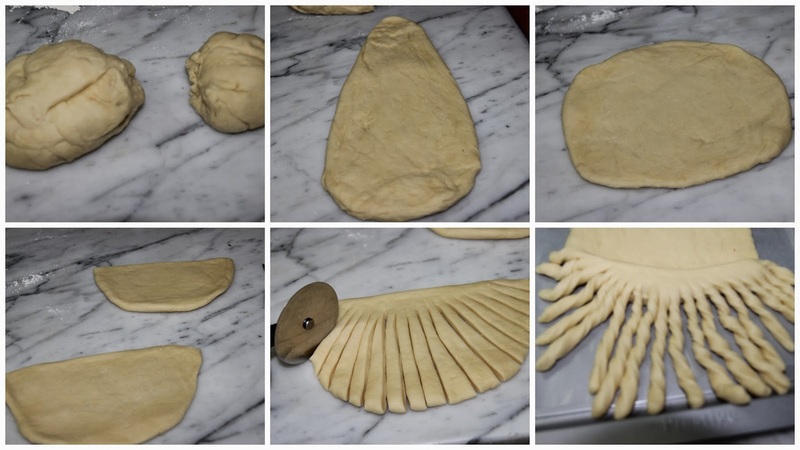 Shape and flatten the larger portion as round shape and cut into half. Using scissors or a pizza cutter, cut both halved pieces into strips to within 1 in. of top. Position both beard one after the other on Santa's face; twist and curl strips. With a scissors, cut two slits for eyes; insert raisins into slits. 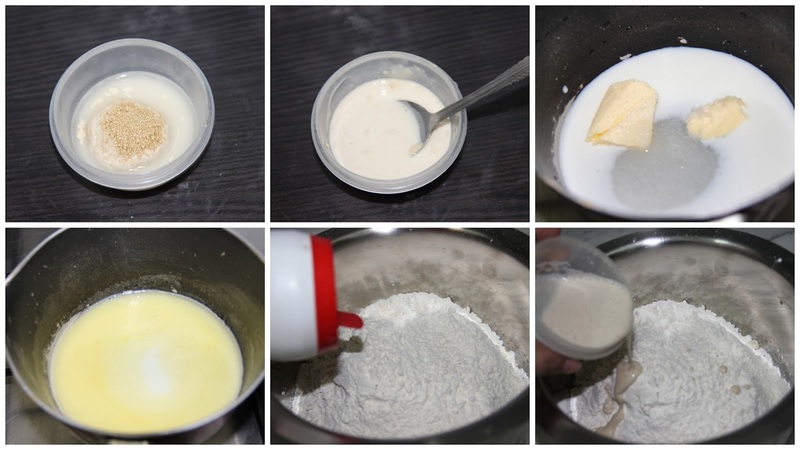 In separate small bowls, beat egg yolk and white. 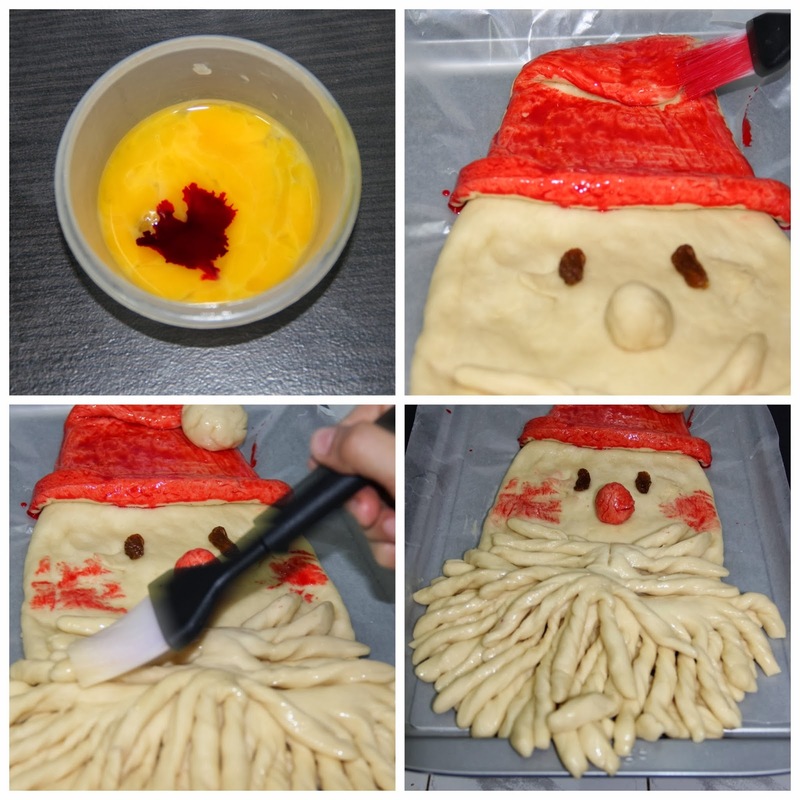 Add red food coloring to yolk; carefully brush over hat, nose and cheeks. 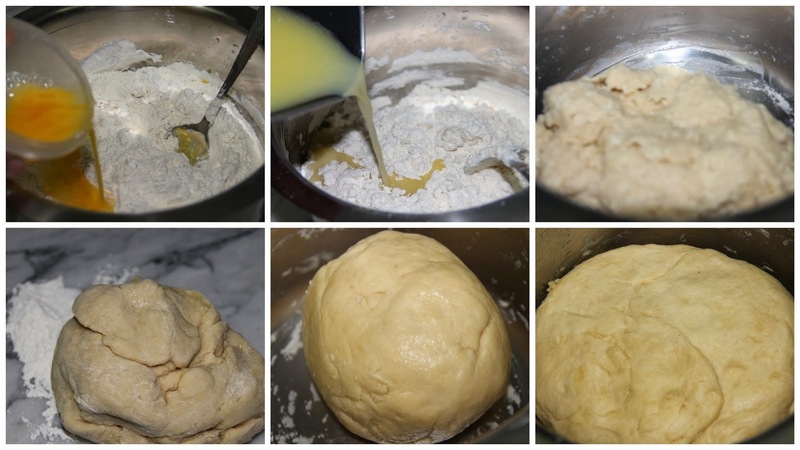 Brush egg white over remaining dough. Cover loosely with foil. Bake at 180°C for 15 minutes. 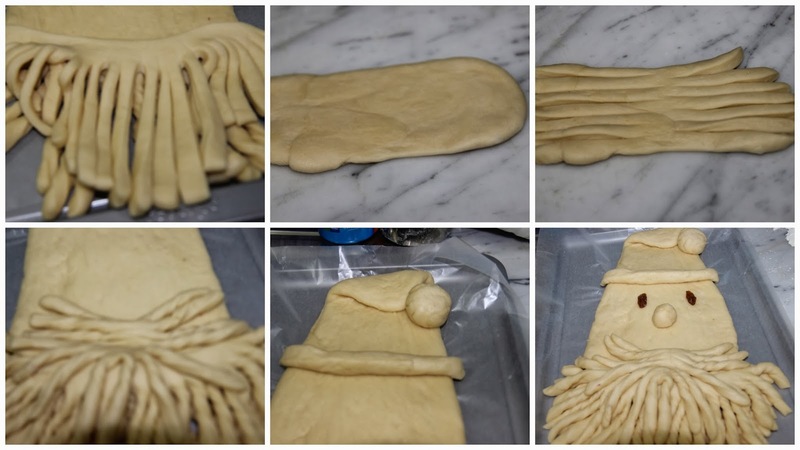 Uncover; bake 10-12 minutes longer or until golden brown. Cool on a wire rack. Good job lincy; you have made it very perfectly. simply wow, well explained and hats off to the beautiful attempt. I honestly do not have the patience. Looks like u had great fun baking these cake . Such a beautiful bread..perfectly baked out n luks so sift.thanx fr d step bt step pics.. This is super cute! I'm sure this will be a hit at any Christmas party! Thank you for the recipe! 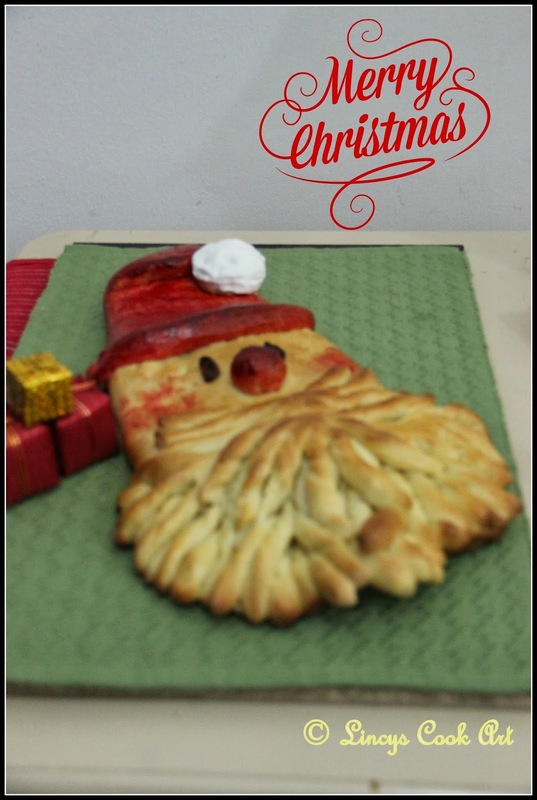 You are sooo creative .. and thats a cute santa. thank you for linking to my event. 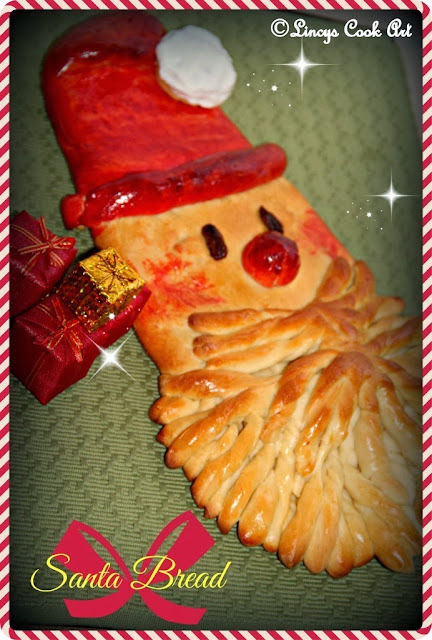 Beautiful santa bread, You done very nice job. Thanks for sharing with Favorite recipes: Christmas recipes event.